Editor's Note: There is a chart associated with this release. 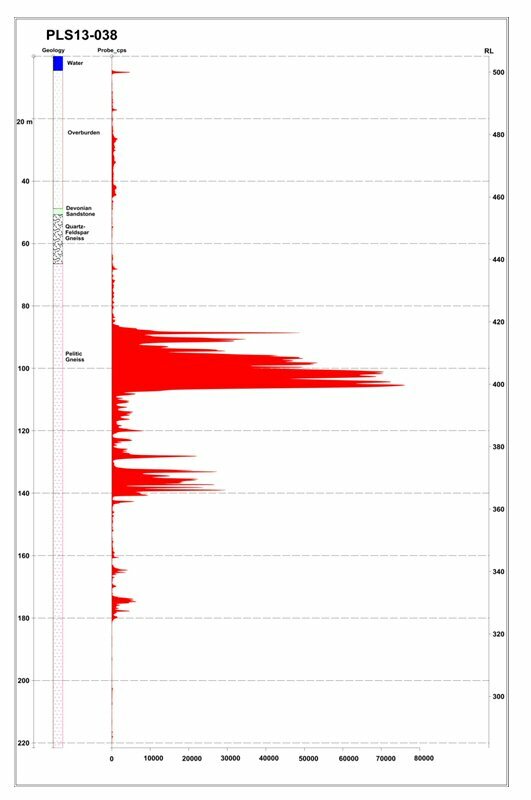 Alpha Minerals Inc. (TSX VENTURE:AMW), (the "Company" or "Alpha"), and its Joint Venture partner Fission Energy Corp. are pleased to release additional results from the Patterson Lake, Saskatchewan, core drill program. Hole PLS 13-038, located along the same conductor as adjacent to the Discovery (see News Release Nov 5, 2012), but 385 meters to the East, intersected two high grade zones within an overall Upper Zone of 57.5 meters of strong mineralization and also a Lower Zone of 15.5 meters thickness of intermittent uranium mineralization. Due to the materiality of the most recent drilling of a target 385 meters east of the first discovery area, it was considered appropriate to release this information immediately. Results of delineation drilling west of the first discovery area and drilling in the area of targets on the lake on lines line 90E and 105E will be released shortly when data compiling is completed. An ongoing field program is in progress. Core drilling continues to delineate and define the mineralized region identified during the summer 2012 program. The drill hole location was selected from anomalous results in a recently completed radon survey of lake water. The survey results of note were as follows. RadonEx Exploration Management of Montreal were contracted to conduct a 191 station Lake Water and Sediment Radon survey over Patterson Lake, on strike to the east of the November 2012 discovery area. Station spacing was generally 20m on 60m lines. Of note, 3 broad anomalous area were identified, with values up to 11.4 pCi/L; A)90m x 70m (L165E - L255E) and B) 240m x 140m (L300E 0 L540E). Drill hole PLS13-038 was targeted to test anomaly B. The third anomaly is located approximately 2.2km east of discovery hole PLS13-022 and will be drilled during this program. PLS13-038 intersected a thin cap of probable Devonian Sandstone that overlies the semi-pelite gneiss hanging wall constraining an intercalated package of pelite and graphitic pelite gneiss. Occasional pegmatite injections were observed throughout the pelite, graphitic pelite, and semi-pelite units. Strong visible mineralization occurs as flecks, blebs, clots, veins, and semi-massive intervals of pitchblende. Of note, wormhole style mineralization was observed for the first time. Moderate to strong clay, chlorite, and hematite alteration were observed throughout the mineralization. The reader is cautioned that the cps readings are not directly or uniformly related to uranium grades of the rock sample measured, and should be used only as a preliminary indication of the presence of radioactive materials. The degree of radioactivity within the mineralized intervals is normally variable and associated with visible pitchblende mineralization. All intersections are down-hole, core interval measurements and true thickness is yet to be determined. The Gamma Log attached below was the result of a radiometric surveyed with the Mount Sopris 2GHF-1000 Triple Gamma probe over the highly radioactive zones. This tool can return more accurate measurements in high grade mineralized zones and samples a larger volume of rock than the hand held scintillometer. The 31,039 hectare PLS project is a 50%/50% Joint Venture held by Alpha Minerals Inc. (AMW) and Fission Energy Corp. (FIS). Fission is the Operator. PLS is accessible by road via all-weather Highway 955, which runs north to the former Cluff Lake mine, (>60M lbs of U3O8 produced), and passes through the nearby UEX-Areva Shea Creek discoveries located 50km to the north, currently under active exploration and development. Updated maps highlighting the successful fall 2012 drill program at PLS can be found on the Company's website: www.alphaminerals.ca. The technical information in this news release has been prepared in accordance with the Canadian regulatory requirements set out in National Instrument 43- 101 and reviewed on behalf of the company by Garrett Ainsworth, P.Geo BC, Vice President of Exploration for Alpha Minerals Inc., a qualified person for the Company. This press release contains "forward-looking information" that is based on Alpha's current expectations, estimates, forecasts and projections. This forward-looking information includes, among other things, statements with respect to Alpha's development plans. The words "will", "anticipated", "plans" or other similar words and phrases are intended to identify forward-looking information. Forward-looking information is subject to known and unknown risks, uncertainties and other factors that may cause Alpha's actual results, level of activity, performance or achievements to be materially different from those expressed or implied by such forward-looking information. Such factors include, but are not limited to: uncertainties related exploration and development; the ability to raise sufficient capital to fund exploration and development; changes in economic conditions or financial markets; increases in input costs; litigation, legislative, environmental and other judicial, regulatory, political and competitive developments; technological or operational difficulties or inability to obtain permits encountered in connection with exploration activities; and labour relations matters. This list is not exhaustive of the factors that may affect our forward-looking information. These and other factors should be considered carefully and readers should not place undue reliance on such forward-looking information. Alpha disclaims any intention or obligation to update or revise forward-looking information, whether as a result of new information, future events or otherwise. About this company Alpha Minerals Inc.